Interview: Jukka O. Kauppinen "Grendel". Service: Mar 1, 1939 LeLv 24 - Aug 31, 1940 LeLv 32 - Feb 9, 1943 LeLv 34 - Mar 6, 1944 HLeLv 30 - Jun 15, 1944 HLeLv 34 - Aug 5, 1944 HLeLv 30. Retired from duty Feb 12, 1956. 5 ½ officially accepted victories over 380 combat missions. 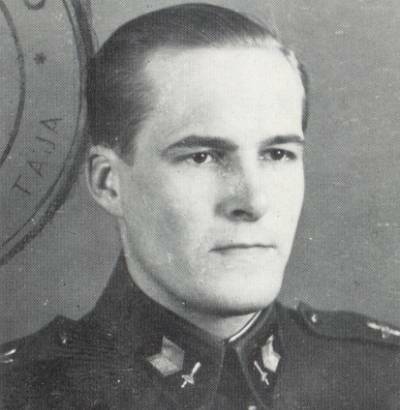 Chief Warrant Officer Mauno Fräntilä "began the flight business in 1936", as he puts it. He was one of the few who piloted the Fokker D.XXI fighter in the Winter War sorties. 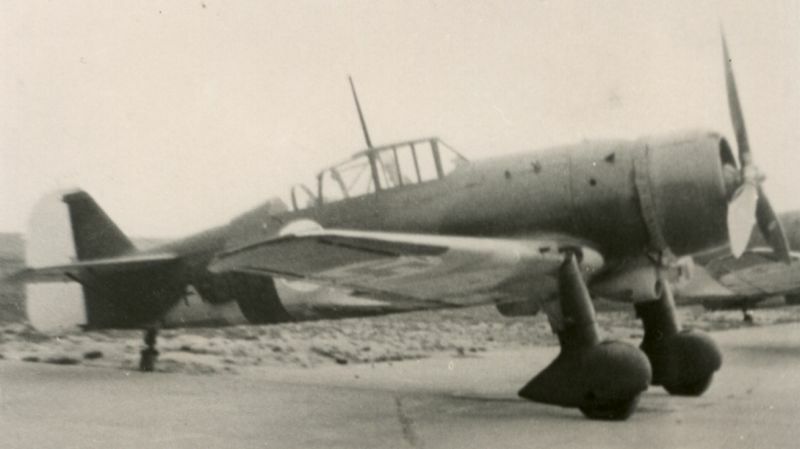 Subsequently Fräntilä served in Squadron 32 and was one of those who were assigned to the new Squadron 34 that was equipped with the new Me-109 fighters. After the war Fräntilä continued as an Air Force pilot, working also as a flight teacher and thus sharing his invaluable know-how to the next generation of pilots. Fräntilä is highly appreciated by his peers, both as a person and a pilot. 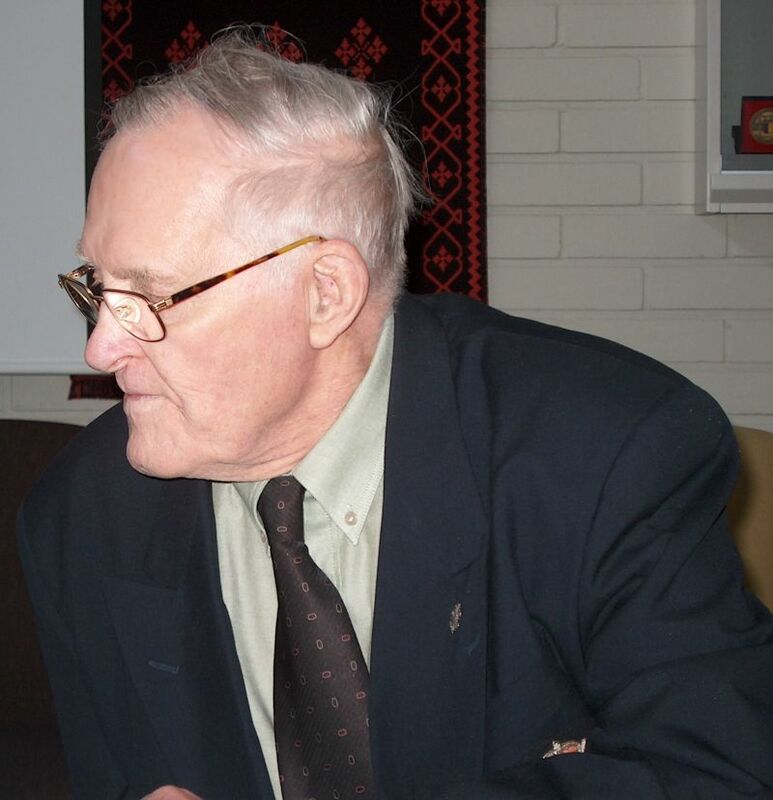 The Virtual Pilots Association interviewed mr Fräntilä in May 2003. Fräntilä approved the text for publishing in December 2003. The interview on 320x240 DivX. Size 112 Mb. The interview on 320x240 Xvid/Divx. Size 138 Mb. The video files can be viewed on all computers equipped with the Divx video codec. Downloaded the codec for free at www.divx.com. Fighter Ace Mauno Fräntilä creating the war pilot glory - Virtual Pilots Association. - How did you begin your piloting? It wasn't until March 1st, 1939, when you were assigned to Squadron 24? I went to the flying business on 1936, on Piloting Course #3. After the initial conscript training I took a two month assistant mechanic course, and then the proper mechanic course. We were the first students in the new school buildings, sharing them with cadets and others. We graduated from the course in August 1937 and continued our service in our original companies. Working at the hangars and flying every now and then. The conscription service took 15 months, and after that it was back to civilian life. Already in 1938 I returned here to the Air Warfare School for refresher training. 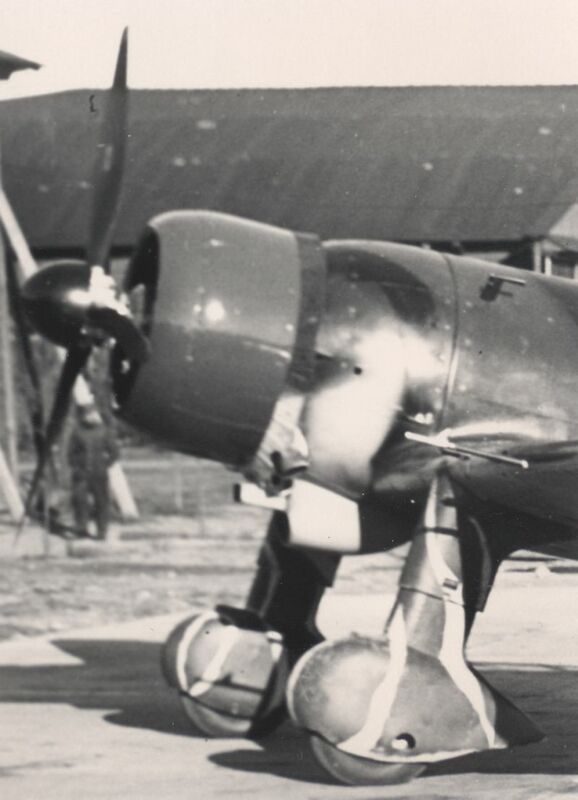 March '38, I took a maneuver flight course at the Karhumäki Airplane Factory at Keljo. The Aviation Association held a 10-hour course, we flew the Bücker Jungmann. It was good training. I was working at the airplane factory in Tampere when I got an invitation for a pilot course again, in 1939. I thought a long time about it, because I already had a good job at the factory, but in the end the piloting job was more tempting. So I reported in. The psychological tests were done once again. The introductory piloting training began in February 1939 and continued until August. After that I was assigned to Squadron 24 at Utti. There we were given rigorous training until the Extra Rehearsals (preceding the Winter War -ed.) began, and the squadron was moved to Immola. We kept watch and studied Russian planes from photos and whatever data we had. The Russians often did incursions into our airspace so we were given opportunities to see if their climb rates were better than the Fokkers'. We flew side by side with them but it was strictly forbidden to engage them in any kind of combat - even if they were flying on our side. But we got ideas of their speeds and spent nights analysing their systems. - Russian planes came to Finnish side and you flew together with them? - What planes they used? No bombers. We flew races with them, checked out who is better in level flight. The Chaika was a little faster but the Fokker climbed better. It gave us a good basis for battle tactics. - Russians got competitive too? Yeah. We got good insight of their planes, and then we could use the info to plan combat tactics. (Richard) Lorentz was the Commander of the Regiment and Magnusson commanded the Squadron (24). We presented our tactics plans to them and then tried them out. So we were well prepared. Russians flew in patrols of three and we in pairs. When the Russian leader fired, the wing planes did too. Our two plane wings could adapt better to the situation, the wing plane could move more freely from side to side. They learned this too, but still sometimes used the three plane patrols in the Continuation War. When the War began, I was assigned to Vuorela's wing. We had done watch duty and were ready pilots, especially as we had got training during the rehearsals too. Air-to-air and strafing gunnery, combat maneuvers and all that. 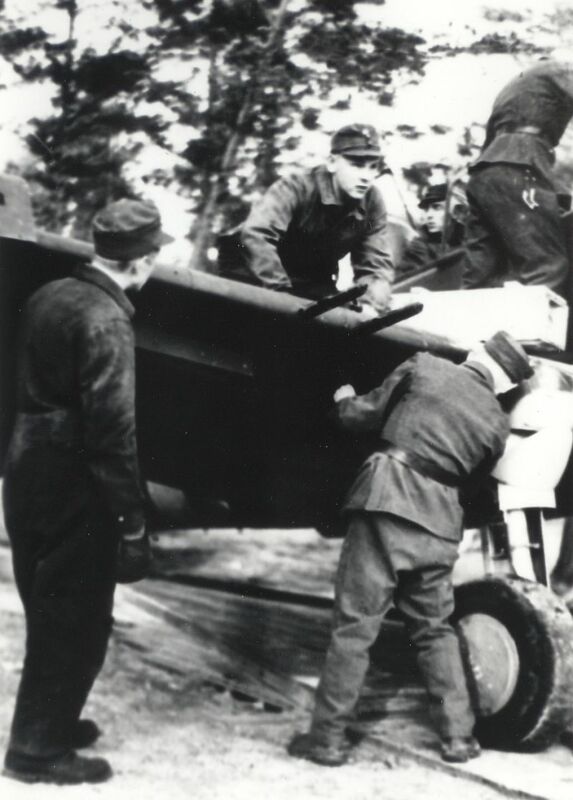 The war began in November 30 and my wing was sent to the base at Suur-Merijoki. Clouds were low when we flew there, but we got there without trouble. Viipuri was bombed and of course we did our best to put a stop to it. Our fuel was stored in underwater tanks, and when the Russians hit the power plant, we had to carry it to planes in buckets. We carried buckets like firemen and poured fuel in plane when Russians flew over, fortunately they didn't spot us. In the evening we went to see if we shot down the kind of plane we thought. Sure it was, with machine gunners and all. Sergeant Kukkonen was coming to us as a replacement from Immola on the third day. He came in low, and our own AA shot him into Viipuri Bay. I was sent to search and rescue the pilot and his plane. We took a truck but we had no equipment for fishing a man from the bottom of the sea. The plane had hit the ice nose down and he had been thrown out. The ice was barely thick enough to support us. All we had was a long pole, we stuck a five inch nail to its end and prodded the hole with it. Finally we caught his fur coat and pulled him out. Didn't get much sleep that night. We spent a week at Suur-Merijoki. I was there when Russian bombers flew overhead. Some officers shot after them with shotguns in anger. After a week we were moved to Lappeenranta. We lived in Hotel Patria at first, in proper beds with sheets and all, but that ended soon. We had to stay at the airfield, since the days got brighter. A week at Lappeenranta, then we finally got a permanent place at Ruokolahti. Four of our planes were sent to Lake Littoinen, when Turku was under heavy bombing. I was there too. We put an end to it. One morning we were south of Maarianhamina, where the Baltic Sea became the Gulf of Finland. After an hour of flying we spotted ten Russian bombers. There wasn't much time for fighting, or we'd run out of fuel; of those ten, six returned according to the air surveillance center. We got four. Then the activity increased at the Carelian Isthmus. Two of our planes were ordered back to Ruokolahti, myself included. Things got rough. On February 29th, the Russians surprised us. In the morning Pentti Kosola, son of Vihtori Kosola, brought Gladiators for the recon squadron and they spent the night there. In the evening Pentti asked if there was a spare bed in our cabin. We pointed one near the door, the occupant had been shot down that day. He said, no way they get two from the same bed... Next morning Pentti was shot down. After that no one used that bed. So superstitious we were. Juutilainen and I were just landing, when the field crew gestured us up in the air again. We were the last patrol to land. We saw two Russian fighters chasing Kosola's Gladiator. We tried to spook them away by shooting from afar, but the Gladiator caught fire. Pentti tried to bail, but there wasn't enough time. We still gave chase to these two I-16's. They already smoked, but their armor was too good. My machine guns' sequencer malfunctioned and hit the propellor blade. The plane shook terribly, and at the same time Illu's guns ceased to work too. We left the smoking Russians over Lake Lempääläjärvi. I don't know if they ever got home. - Your guns had no effect, other than pulling smoke? 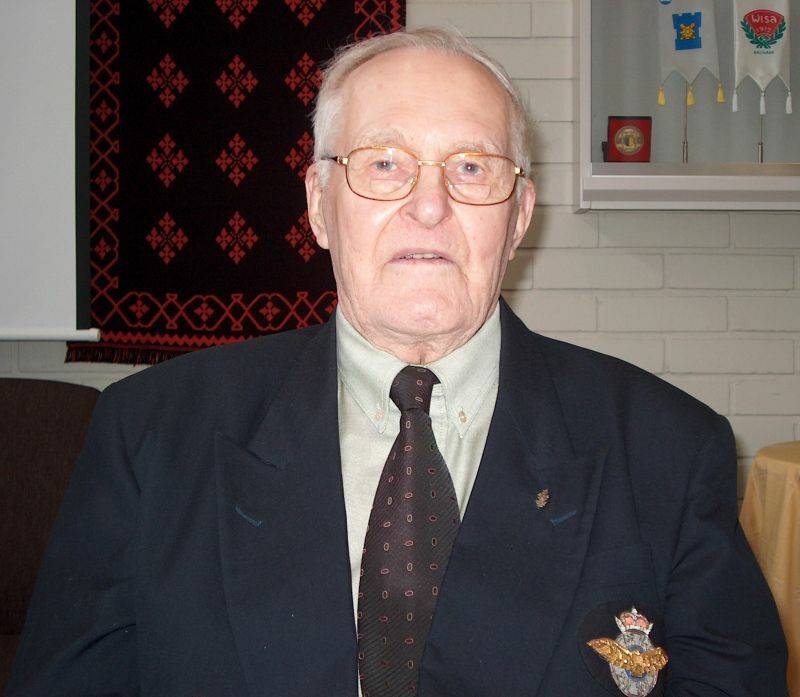 Ruokolahti veterans told that they had counted 80 holes in one Russian plane shot down. - Did you get refreshment pilots in the Winter War? My first Fokker was number 76, Dutch, with which I was shot down in the Winter War. During an air-to-ground sortie on March 5th (1940). I don't remember it being in that poor shape. Someone has torn it up. That (plane in the photo) is on display in St. Petersburg. Maybe the front line men tried to destroy it but couldn't do it properly. On March 5th at 4:30 pm we were at Lemi. Our take-off was delayed by half an hour. Luukkanen was the leader. We were smoking, Luukkanen gave fire to my cigarette. He even said it was bad luck, and that proved right. We got up in the air quarter to five, first to Hamina and then over the sea, when we heard that Russian fighters were under 2000 meters. Thirty planes covering the ground troops. We circled there by south, I was the last. We dove from 2000 meters, the Russians shot with all weapons. And then my shoulder was hit. Gauge parts flew all over. - Was it ground fire? If I hadn't crouched like this when shooting, it would have come right between my shoulderblades and into heart. But I was aiming like this. I swerved away and I had enough speed to shake the Russian. No one followed. I landed on a field, the plane had skis. It came to standstill some 50 meters from a shed. I knew I had to go quickly, soon they'd come to finish the work. I tried to take my chute with me, but couldn't. Someone spoke foreign language from my right, and suddenly a machine gun shoots at me, snow flew on both sides. I could move five meters at a time before having to rest. They stopped shooting too, and began again when I moved. The whole 50 meters they shot, all the time. It was a miracle that I wasn't hit. Finally I was in cover by the shed wall. The russkie looked, I lay still, they were so close. Then I heard Finnish words and called them to come and get me away. They answered that they couldn't before dark. The russkies began attacking again, as I lay there on no man's land. - By the hay shed? When the boys game to get me out, there was heavy mortar fire. I was afraid they couldn't do it. But they did, with a sled. It was quarter to six when I landed, and after nine there were two men with a sled. It was as bright as day, when the russkie shot flares in the air and prepared to attack. But I got pulled out. I then found out who exactly had shot at me; they were Swedish-speakers from the coast, just brought to the line. Much help they'd be I thought, they couldn't hit one man even with a machine gun. There were 20-30 of our casualties piled in a horse sleigh. The poor beast was frightened by mortar fire. They put me on top of the dead and tied me there with a rope so I wouldn't fall. Some five kilometers I was in the sleigh, holding on to a dead man, and the horse pulled real fast. - And then you were patched up in the military hospital? They took me to the Rauha hospital. Six patients on stretchers and 20 of us sitting on a hard plank bench. We left at 11 pm, and were at the hospital at 5 pm next day. We had to give way to refreshment troops all the time. I was going to report to my squadron that I was still alive, when a Doctor sent me to operation room instead. They'd call the squadron, but I had to be operated as hairs of my fur coat had gone in both sides of the bullet hole. The operation began at 7 pm and was ready at nine. Three days later I was sent to Vaasa and spent two months there, then I was given a month's leave. My shoulder began to ooze pus, and even if I visited the midecs at the Air Warfare School daily, all they did was change the bandages. It stunk. A month went by, and Karhunen, the doctor, wrote that I couldn't go back to my Squadron. There was a squadron at Malmi, I'd go there. I went to cry to Magnusson, the Commander, that my shoulder is in poor shape, oozing and all. He made some phone calls. Soon a bone doctor at Tilkka would see me. Next morning I went. The Doctor examined my shoulder, took a spoon and carved seven bits of bone off. One week and the wound was healed. - So you spent the end of the War in hospital. 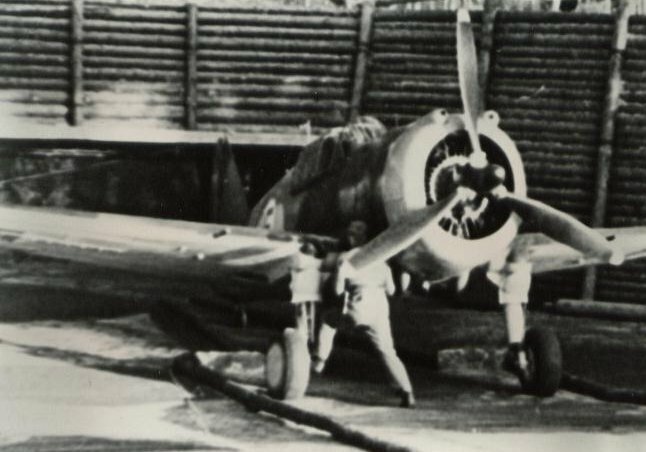 What was it generally like to fly in the Winter War? Harder that in the Continuation War. There were no spare pilots, so when you put on the chute in the morning, you took it off late afternoon or evening. There was no time to grab a bite, you landed only for quick refueling and ammo resupply. I flew 60 sorties in February, there could be five or six sorties on a single day. Midwinter was cold, so there was less flying, but February was again full of sorties. During the intermediary peace we got to fly the Brewster. When Kaleva, the passenger plane, was shot down over the Gulf of Finland. Juutilainen had flown over the place previous day and then asked me to go with him and see the place again. All I saw was an oil patch in the sea. - How was it like to fly the Fokker, in your opinion? It wasn't anything special, but there was no better. When Mikkeli was bombed I wished it had oars, so we could catch the bombers by rowing. Though it climbed well, it was no dogfighter. It'd lose to the Chaika and I-16. - At first you flew a Dutch-made Fokker with the Mercury engine? Did you fly the Finnish-built Wasp? Was there any difference? Yeah. We got the Wasps at the beginning of the Continuation War. The Wasp was even weaker. But then the recon squadron were ordered to give us their Curtisses. They grumbled about it as they got our Wasps in exchange. - Your Fokker had skis when you were shot down. Were they used all the time? Yeah, all the time in winter. - Slowed you down, did they? Sure did. We didn't use much of those cover plates of them, either. They didn't hold on. - Did the Fokker engine have the combat emergency power setting, like the Messerschmitt? - How about a governor that kept the power setting in check? No, I don't remember any limits. We had to fly at full power all the time to have any chance. - It was a trustworthy engine? Yes, the Mercury didn't break easily, and the Wasp wasn't too bad either. They were new engines, after all. But they were lacking in power. - You could fly with full throttle in a pursuit, and the engine held? - How about fuel, did you have to adjust the feed to get enough flight time? No, the consumption didn't change much with less throttle, and in combat we had to fly at full anyways. As with every plane. - I guess you had to fly at full throttle so you could get away from faster foes? That's it, speed was essential and should never be lost in combat. Never become a cross in the sky. - The Fokker endured dives well too? I don't remember if it had a set max dive speed at all. Sure it was heavy to level off, but it was so with all planes in a dive. You have to pull with all your might. - It was rather primitive design, wasn't it? It had kind of slits in the leading edge of the wing, or some of them at least had. No proper flaps, not to mention an adjustable propellor. - I guess it was easy to learn, when you had flown earlier planes? Yes. Landing was a bit difficult. If you pulled too early and lost speed, it swerved to left wing. Like the Pyry. There was nothing to do but nut do the pull too high. You had to bring it down all the way. - How about diving? It was heavy to level, but how did it behave otherwise? Nothing special, normally. It accelerated pretty well. The Russkies never followed us to dive. I guess their maximum dive speeds were low, so their planes would break if they came after. - How about the Fokker guns? You only pulled smoke from the I-16's, but you got one SB-2 in the Winter War? We were at Ruokolahti, when over 20 SB's were going towards Mikkeli. Six of our planes took off. The bombers were at 5000 meters, so it took time to climb up there, and the SB was almost faster than our Fokker. But they had full loads, so they flew slow. We got to 500 meters from them, below. It was a very cold day, smoke was rising from the chimneys at Mikkeli. We felt sorry for them. We tried to shoot from far away, maybe that's why they dropped their loads early at the town limits and turned back. Then we were on them. We shot at many planes and drew smoke. They flew in close formation for firepower. We had to make some slow down to break their formation, the others wouldn't wait. We knew the blind angles of the SB, so we could hit hard those that were left behind. First the machine gunner. I hit two, but one probably caught fire only after crossing border. The other fell. Then I was out of fuel. - The small calibre guns were effective at close range? Yeah, the guns shot at a point 150 meters ahead. There were two guns in the wings and two in the fuselage. - Did everyone have it at 150 meters, or could the pilot set it? Usually the point was at 150 meters. Same as the fuselage guns in the Messerschmitt; the cannon shot straight. If the pilot wasn't hit, the guns could have no effect. (One incident:) We were chasing a Russian plane, and Juutilainen went to his side to see the pilot. He said he saw a black face. Then he lagged behind a bit and tried to shoot, but his guns malfunctioned. I asked why he flew so close, he said he wanted to see what kind of guy there was, if there was anyone at all. - Why didn't they run for it? Their engines were smoking already and lost power. We were so damn good. - Kille Arnkil mentioned having chased a Chaika with you. He said it was as if the pilot had sat backwards, he always turned to face you. Yeah, when Suursaari was taken in '42, we shot down 23 fighters. The HQ accepted only 15. I got three but only 1,5 was added to my total. - On August 31, 1940, you were transferred to Suadron 32. You had the Wasp Fokkers at first? Yes, I went to the trainer pilot course at Kauhava during the peace. When I went to the squadron, there was an order to send trainers to teach pilots. The only one of us who had been on the course was me. So I went to Siikakangas and trained Fokkers there. We lived at Ruovesi. When the Continuation War began, we were first at Hyvinkää, but it was too far to fly interceptions. We were moved to Uttian dreceived the Curtisses, but it was still a long flight to Kotka. Kotka was a target for bombing. We were always late. - The 32 had many new pilots. Everyone had gone through the flight school, but what kind of training did you give in the Squadron? We took the new kid on our wing and taught them in practice. They saw how to fly in a sortie. We got new guys all the time. - Not every squadron had this good system? Some have said they got no training at all in the squadron. We made it a priority to teach the ropes to the new guys, maneuvers and all, even if we saw no enemy on a flight. But we used the sun and clouds. - You told them over radio what to do and how? - New pilots had steady partners to fly with? Mostly, yes. New pilots never flew together. There was no radio in the Fokker, we had to show with hand gestures when we spotted the enemy. The Curtiss had radio, it made things easier. - Did the radios work well? Not very well, even in the Curtiss. - You had to adjust them, or they worked in the ground but not in the air? - What was it like to switch to the Curtiss? Training, learning the tricks, joy of flying? The only training I got was to fly from Utti to Lappeenranta and back. That's all, half an hour. It was certainly better than the Fokker, faster and maneuvered better. Weapons were as weak, only rat guns (MG's). Fared well in combat against the Russians, you could even dogfight. Not with the Chaika, but well enough against the I-16. - The guns were 7.5 mm, so they were as effective as the Fokker? It had two guns more, did it help? Hard to say. We were at Muolaanjärvi, when we heard of two Russian fighters harassing the front line. I went there with Aimo Gerdt (Aimo Emil Gerdt, SLM 655, b. 23.11.1919) and engaged them. One Chaika tried to run, I told Gerdt to go after him and began a dogfight with the other. We chased each other, the first one to pull off would get it... Gerdt then came back, he couldn't catch his target, and watched. Finally the Russkie tried to run, I hit him hard enough that he had to land. We went back to base. Nurminen, the flight leader, asked why I didn't destroy it. But how the devil can you go that close over the front line? 'It won't be added in your tally, it made a forced landing.' It's flight ended there, but I couldn't finish the job, I'd get shot from the ground. - Curtiss dogfighting a Chaika? It must have been amazingly agile, if it could cope against a Chaika. Depends on who's flying it, how much you dare and how well you know your plane. You have to fly by the seat of your pants. It's funny, you didn't even need the speed gauge, you could feel it in the tail. Same thing in the dogfight, when you should never lose your speed. - With enough experience you knew all the time how the plane behaved? Like the Messerschmitt - it fitted well in your hand. You learned to know it well. - You had the Curtiss until February '43. How did it fare against newer Russian planes? It was starting to feel weak. We'd have been in serious trouble if we hadn't got Messerschmitts from Germany. I was there to receive the first Me's. Our Curtisses, Brewsters and Fiats were already getting to the end of their time. - You got twin heavy MG's in your Curtiss. Were they any better? I was ordered to Halli where my plane would be fitted with heavy MG's, over the engine. But when they were tried, they didn't work at all. I had to fly back. They couldn't take the stress in a climb. Yeah. They were French guns. - How far was the convergence point of the Curtiss guns? It was about 150 meters in all planes. - All guns were aimed at one point, or were there different patterns? Usually at one point. They weren't calibrated much. The Messerschmitt guns were calibrated at Malmi. The G-2 had rat guns at first, then 13 mm's. But they weren't trustworthy, they didn't always work in a pull. - The Curtiss 7.5-mm guns worked only from close? - How about when the planes got older? Pretty well. The Messerschmitt cannon had often failures. The ammo belt broke or a shell went sideways. Sometimes it began working again if you gave it a shake. Karhila took a Messerschmitt with three cannons. Three cannons drained your speed, but he had often had trouble with his guns, so he thought that maybe at least one of those would work. He scored kills with it. - You had hard times at Aunus, when chasing Pe-2's and other fast enemy planes with the Curtiss? Yeah, the Pe's only waved back at us. But with the Messerschmitt we got them. - You've written at least one article of the Messerschmitt receiving trip. Was it on the first such visit, when a Pe-2 passed over 100 meters above the Hanssin Jukka on the way to Germany? The Hanssin Jukka carried our mechanics, always to the same field. Four days from Wiener-Neuestadt, south from Vienna on the Hungarian border. - How many times did you go to Germany? Twice. First in February '43, then in May 13th, '43. The first trip took a month. We were trained in a place called Werneuchen, near Berlin. I flew three hours 55 minutes on the Messerschmitt. Three flights with the old Emil model. Then we were off. They didn't want to let us go yet, but Ehrnrooth put his foot down. "There's a war going on, we have to get back. Tomorrow in train!" So we took a train to Vienna and over the border to the factory. They held a party to us, with pickles and wine! And the next morning, March 10th, we were supposed to go home. - Was this the trip when Lahtela's canopy suddenly opened on the way? Yeah, at Riga on the first trip. They were left behind, Nyholm and I came home. We were four planes, and Lahtela told us to keep going. He and his wingman turned back to retrieve his jacket. Nyholm and I came to Malmi. - What was Germany like in '43? When others visited there '44, everything was in ruins already. (Fräntilä was supposed to be sent to Germany for night figher training on Summer '44.) We were told to fly instrument flights as trainers. I with a Viima. But in the end they wouldn't send fully trained Messerschmitt pilots there any more, they sent untrained people instead. 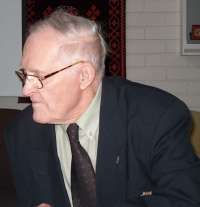 Ehanti and his group were then interned (Finland's relations to Germany were broken before the pilots got back home -Ed.). They came back by boat, Galland arranged their return home. - Politicians make their big decisions but pilots stand for each other. - You spent a month in Germany. Did you get to look around, how was life there? We went once to Berlin and suddenly there was an air raid. We had to spend the whole night in shelter. Loud rumble and bombs falling, there was no way you could put your nose out the door. It was nice to sit in a cantina there, they served liquor. I tried to chat with the jerries, but they didn't understand a word I said. They left us alone. The only friend we made was the waiter. We were going to arrange a dinner for our quartermaster, but he never came. His wife didn't let him. - The first batch of Messerschmitts were in good shape, there were no bad accidents? The first batch came directly from the factory. The second were used G-6's. The G-2 engine had no durability, it had to be changed even after only 30 hours. G-6 was better in that respect. - I wonder why? I'd imagine those made in '44 were poorer. This was February '43, and they were G-2's. We got G-6's only later. The worst of them lasted only 30 hours. It was always guesswork if the engine would hold together. Yes, fit in my hand right away. You had to be careful in take-off and landing, though. The rudder was small, you shouldn't lift the tail right away, but accelerate gradually and keep the direction with brake. When you felt the rudder had effect, you had no trouble any more. And you shouldn't let it bank at all when landing. Remember that you had a three meter long engine in front of you, a big propellor and narrow landing gear, if it started to roll you had to let loose. - Pokela has told me that he took special care to teach the proper take-off and landing on the Me. How about the Germans, I've heard they didn't believe you could fit the planes in our small fields? They spoke of how the final approach speed should be 220 km/h. That would overshoot the field, we said. We landed at 180. No, it was basically the same. Except now we had better climb rates than the Russians and we could split better. And of course gain surprise. With speed, you could hit and run. And not spend much time in their sights. The Russkies never followed to a dive. Their max dive speeds were too low, I suppose. It was the same in the Continuation War, their La-5's and Yak-9's turned quickly back up. The Messerschmitt was exellent. You got always away when you pushed your nose down, and it then rose like an elevator. You soon had upper hand again. - Was the Me so good a climber that you could run by pulling up? You should never lose your speed. Always get back up. The one who is higher has the advantage. You could shake the other with a climbing turn, he had to turn harder. Tighten the turn when the other tries to get into shooting position. The Messerschmitt climbed better, so it got away. Handy. The one who is in the inside of the circle loses his speed and doesn't get into position. You could use it against Yak-9's and La-5's, they were no more nimble. - Boom'n'Zoom was your main tactics all the time? Yes. Surprise, and always using the sun when you could. - When you spotted an enemy plane, you circled to the sun side and then approached? Yes, using the sun and clouds. It was always good to gain surprise, too. You were in control of the situation and could break away for another attempt. - Speed was essential, but how about the Me's slow flight abilities? It had the opening slats in the wings? I dunno. It got so slack at 10,000 meters that it just swam. Lost speed and all. It didn't make any sudden moves, even if the speed was lost. You could handle it. - Did you ever get into old fashioned dogfight with the Me? Nobody liked to go into one. Same with shooting head-to-head. The Airacobra had the 40mm cannon. Like getting a tree trunk in your face. You had to avoid such a situation, it'd end up in a tie. Too risky. - In the newspaper Pohjalainen there was a story where you remembered the Me and said how it turned well, as long as you could pull hard. Yeah, you could pull yourself to the twilight zone. Eyes clouded, but you still didn't lose consciousness. The speed dropped surprisingly quickly in a tight pull, though. - How heavy did the Me controls get at different speeds? It got heavy, but you could use the flettner. It was nothing special, but a big help. Once in '43, there was a Boston III above the Gulf of Finland. I went after it, and we went to clouds at 500 meters. Climbing, climbing, climbing and climbing, all the way to seven kilometers, and it was just more and more clouds. It got so dark that I lost sight. I turned back down, and saw the Russkie diving too. Speed climbed to 700 km/h. I wondered how it'd turn out. I pulled with all my strength when emerging from the clouds, then used the flettner. I was 50 meters above sea when I got it to straighten out. I was all sweaty. At that time the Me's were new to us. I thought the cloud wasn't thick, we'll go over them and see who's the boss. And it was up to seven kilometers. Where the hell did all that cloud come from? - The Boston climbed in a cloud, and you saw it all the time? Yeah, I saw it. Tried to shoot too. The Cloud got thicker all the time. I don't know if it just climbed better, it was a fast plane, American made. I scored some hits as we went. I had to keep an eye on the gauges to see which way we were going, and was I still head up. - Did the roll capabilites change? Not so much. It got stiffer, but you still could bank. - Were you still in full control at high speeds, like at 600-700 km/h? - How about slow and medium speeds, could you do stunts? Yes, but it was heavier than the earlier planes (Fokker D.XXI, Curtiss Hawk 75). But better in combat. I got to fly the Hornet simulator last summer. That stick moved only little. - How comfortable was the Me cockpit? Did your glove fit well on the stick? I suppose the gauges were well positioned and it was easy to command? Yes, it fit like a glove. - Was it a tight fit? You got used to it. Both shoulders were against wall, which didn't help when you had to look all around in a battle. But we weren't wearing too much either. - How did you see out? The armored glass made it a bit difficult to see behind, you had to kick the rudder a little to get a view. - How about when doing a climbing turn, how well did you see behind? - Tightly strapped in your seat and still could look behind? The straps weren't so tight you couldn't move. Sometimes a lot. - About these victories of yours. They said at the Air Warfare School, that once they didn't accept one from you, and so you stopped reporting them completely? Well yeah, there were some nitpickers there that demanded more evidence. Like what Luukkanen said to Hasse Wind and Juutilainen, you deduct half and he a third. - And they accepted only one and a half at Suursaari. And those were the obvious cases. - Did you keep any kind of score by yourself? Yes, in the end I'd count sixteen for me. Once I spoke with Erik Lyly (SLM #832, b. Aug 5, 1914, a Mannerheim Cross Knight in Karhunen's squadron. He was from Tornio and lived in Sweden. He was overnight at my place at Kauhava. Some time in the evening he said, "it was Generals who made him a knight." Dunno if that's true, but that's what he said. - When did the conflict begin? When Nurminen didn't accept my shooting down one of the two Chaikas over the front line. One ran, but I got the other, it made a crash landing in a field. Forget it, I said. If you don't accept it then forget it. - Was it at the end that you reported your own victories, or did the others do it? I thought it wasn't worth it... I didn't spoke of it much, it'd only cause bad talk. Things like these. - We spoke with Hemmo Leino. After Geust's inspections, his victories were doubled. According to Russian records, there were over 20 kills where he was involved. But he said he wouldn't talk about it. The official score is what's written in the books. That's what counts. 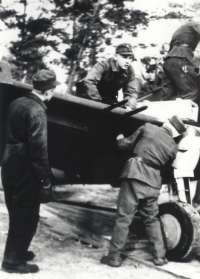 Mauno Fräntilä and Jukka O. Kauppinen at the Air Warfare School, Kauhava. - Torsti Tallgren was one of your students after the war. He's spoken highly of you and mentioned of how "Mauno Fräntilä, a tough fighter, dropped me three times in 20 seconds in one exercise before I could do anything. I had no hope against him before I learned the ropes." Your long experience shows. No hard feelings. I flew my last flight with a Pyry, and when I closed the cockpit after me, it was over. It was 1956, I flew here (at Kauhava) until then. I took off once more with a Fouga. A jet is easy to fly, it doesn't try to roll. It was with Erkki Parviainen. We did some maneuvers, you could do that with the stick only, no need for rudder. It was about as fast as the Messerschmitt. 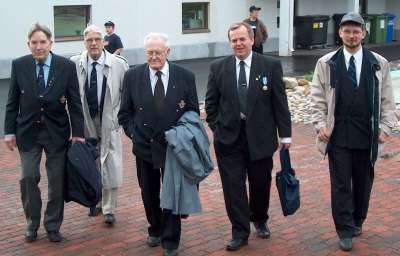 From left: Pentti Aro (PLeLv 42, Blenheim pilot), Aarno Siro (HLeLv 26, HC/FA/BW pilot), Chief Warrant Officer Mauno Fräntilä, Göran Bruun and Olli Korhonen of the Virtuaalilentäjät ry. On May 2003, when I was interviewed by the Virtual Pilots, I forgot to tell a couple of incidents when I was very close to death. 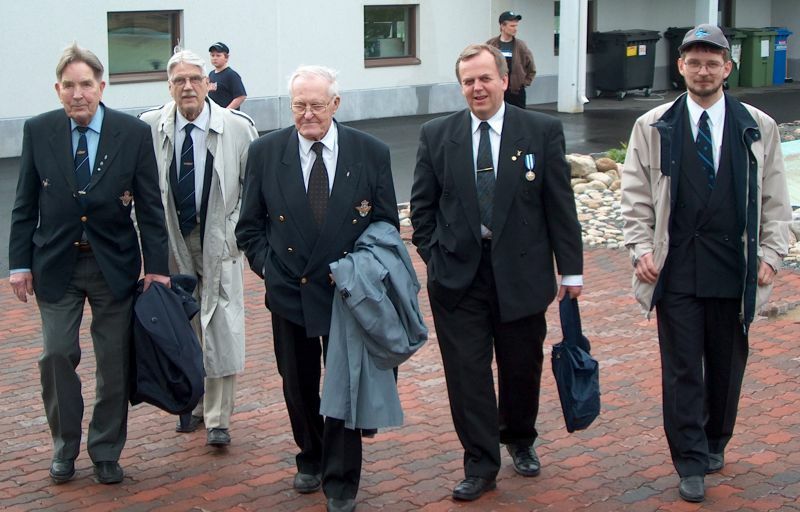 On August 20, 1943, we were at Malmi airfield protecting Helsinki with Messerschmitts. There was a lonely bomber approaching the city, probably coming to do photography. I was sent to intercept. 2ndLt Laakso was on my wing. We flew straight to the coast between Tallinn and St Petersburg, at 3,000 meters. Lonely recon planes approaced Helsinki from Tallinn latitude and returned the same way. After a while a bomber was coming from the direction of Tallinn, 200 meters below us. I throttled up - and a loud bang came from the engine. I thought I had been surprised by an enemy fighter. But there was nothing in sight. Should I crash at the shore? The engine rumbled on, and since I was 3,000 meters up I could attempt to get back to Malmi over the Gulf of Finland. T made the decision and turned towards Malmi. Halfway over the Gulf the engine caught fire. I was still at 2,000 meters. The engine was on fire, but it still ran. No ships, empty sea, so I had to go on. Landing in the sea would have been certain death. I contacted Malmi by radio. The coast approached, but speed dropped too. I told I'd bail out as soon as I was over land. I broke contact, jettisoned the canopy and opened the seat belts. I crossed Santahamina. I got up and sat on the edge of the cockpit, then threw myself back and pulled the chute handle as soon as the rudders went past. The chute opened well. The jumping altitude wasn't much over 200 meters. A couple of days earlier I had got some experience in flying a burning plane. I was returning from an intercept sortie to Malmi, when I smelled gasoline in the cockpit. Then I saw the engine was on fire. I reported by radio and told I'd land on a certain runway. I made it, and the fire squad extinquished the fire. The oil cooler got broken. I got slightly poisoned by the gasoline fumes. On June 22, 1944 we were escorting bombers over Tali-Ihantala. Hard AA activity. My plane was hit and the engine stopped. I reported to my wingmate, Juutilainen. I had to decide now if I should bail, or try to land. I lost altitude quickly, because I had to keep the speed at 250 km/h to retain maneuverability. I was going to land on a field, but then saw it'd be too short for it. There was more room across the fields. I dropped the canopy and tightened the belts. Just before hitting ground I kicked the right rudder hard, so the plane would hit the ground wing first and not roll. I made it. I hit my nose in the aiming device, stars sparkled in my eyes. My nose had to be operated four times over years to get it fixed again. The landing happened at a place called Vahviala, where we had heavy artillery batteries. Motto: "not everyone dies in the war". On this page is the interview of Chief Warrant Officer Mauno Fräntilä. 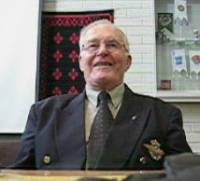 Fräntilä was interviewed on May 24th, 2003, at the Kauhava Air Warfare School Guild annual celebration by Jukka "Grendel" Kauppinen and Olli "OK" Korhonen of the Virtuaalilentäjät ry. Warm thanks to Lauri Väisänen of Ilmasilta, Tampere, as well as the whole Guild personnel. Airplane photos from the collections of Virtuaalilentäjät ry.